City of Heroes offers players a tremendous variety of powers to choose from when creating either heroes or villains. Each of the more than 40 different powers has many sub-powers, giving players hundreds of distinct super powers to choose from. 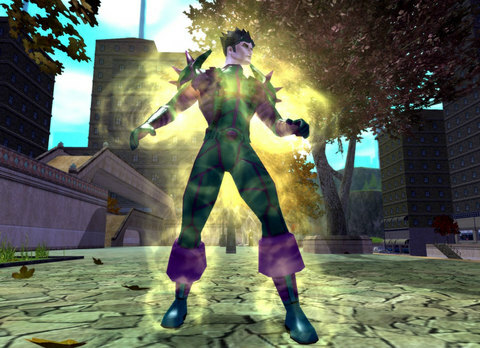 Sub-powers are further defined by a number of different factors such as range, damage, area of effect, and special side effects. Taken all together, this wide variety of options allows players to customize their heroes to a remarkable degree. Powers can also be personalized through Enhancements. Every Power has a number of potential "inventory" slots that can be filled with Enhancements. These rewards boost things such as Range, Damage, or Accuracy — an Enhancement can also decrease Endurance cost or time to cast. Every other level, a player can assign an empty Enhancement slot to a Power; he then can fill it with whatever Enhancement he gets on his adventures. There's one caveat, however: once an Enhancement is slotted in, it CAN'T be removed without destroying it.